It is our pleasure to introduce you to Master Mechanic Hamilton. We hope that you can find all the information you need to familiarize yourself with who we are, what we do and how you can find us. We promise to do our utmost to deliver our professional service in a very personalized manner and we thank you for wanting to learn more about us. 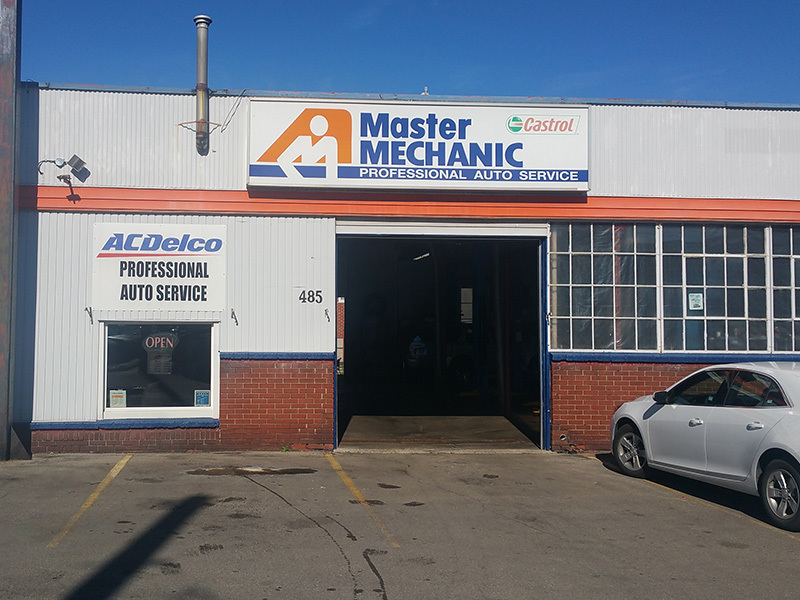 Our Master Mechanic Hamilton store is located on East 38th Street right off the Lincoln Alexander Parkway between Upper Gage and Upper Sherman. At Master Mechanic Hamilton we understand that you are busy so we promise to provide honest, trustworthy repairs in a timely manner so you can get on with your day. 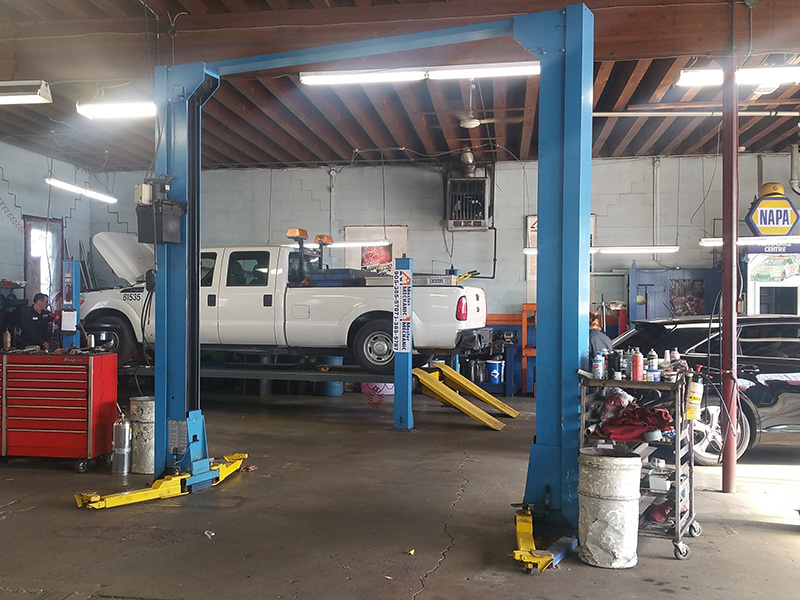 Our Master Mechanic Hamilton store is independently owned and operated which means that we are providing a personalized service to our customers. We strive to be the only auto repair and maintenance choice for each of our clients by creating long term relationships which have been earned through consistent delivery of outstanding service quality in an environment which promotes trust, fairness and respect. It is this dedication that differentiates us from our competitors as we continually strive to deliver an outstanding customer experience to each one of our satisfied customers. "Rachel B Wonderful caring people! Gord and Serena took us in at a moment's notice when we were in Hamilton recently and our car developed some rattling and banging noises. They were able to get the parts and have us on the road in less than 24h, after showing and explaining what had been done. Friendly staff throughout the business, and they really seem to look out for their customers. We would be happy to use their services again." "Nick Fotache Serena and Gord were fantastic. They were super friendly on the phone, took the time to discuss our problem and offer some suggestions. They performed the repairs on our car quickly and the price was lower than most of the competitors we called before we came in. The service is top notch here and I will be a customer for life. HIGHLY RECOMMENDED!" "Was in for oil change on Saturday. Lu'ay took me right away. The shop was only open for another hour but i was taken care of. They even advise me, my oil seal was starting to leak and gave my Rondo a wash. First thing Monday i received a email for the quo..."
Use this coupon to receive 10% off any service over $100 at Master Mechanic Hamilton. "Was in for oil change on Saturday. Lu'ay took me right away. The shop was only open for another hour but i was taken care of. They even advise me, my oil seal was starting to leak and gave my Rondo a wash. First thing Monday i received a email for the quote on changing my seal. Couldn't ask for more prompt service. Cheers!" Turned me into a return Customer! "Great people here. I got scheduled in for a last minute tire change, and they were very accommodating despite me being late for the appointment. Very friendly staff that make you feel welcome and valued enough to be a return customer. Even a complimentary car wash!" "Excellent service, very friendly manager, i used this company for the first time to instal my winter tires but i won't go anywhere else for any mechanical issues from now on!" "Took car in today for an alignment and oil change. Owner was very professional and friendly and car drives excellent now. Will definitely return in the future." Most Friendly & Helpful Shop Owner I've ever met! "Lu'ay, the shop owner, was very professional. He was the most friendly and helpful shop owner I've ever met. If you have any car problems, give him a call, you will be impressed from the minute he picks up the phone." "Very good! The online form to get an appointment is very useful. They phoned me in the morning to set things up. They doubled checked my findings and checked only what was needed. They got all the codes cleared and sorted out - no issues now. I will go back in the future." "Great customer service will be coming back for sure"
"Great friendly staff! Do a very good job here im very happy with the good work on my vehicle! For sure a recommended place to go !" "Amazing service my van had a spontaneous gas line go and I was stuck what to do he was very friendly and affordable I will be a life long client :) :)"
"Excellent work on my car. They repaired a broken muffler and Luay made sure my tires and engine got checked and hooked me up with a solid deal. 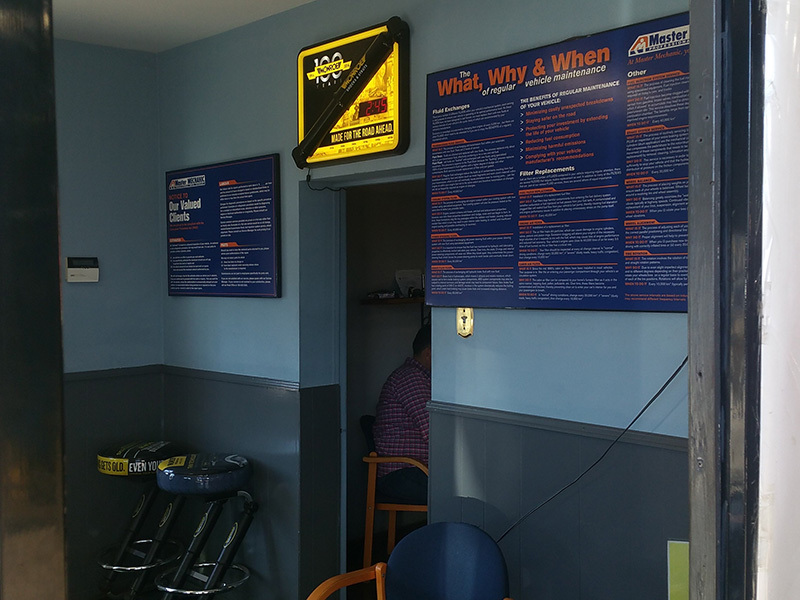 Great setup too for those who like to watch their car being fixed from a safe place. Thank you guys." 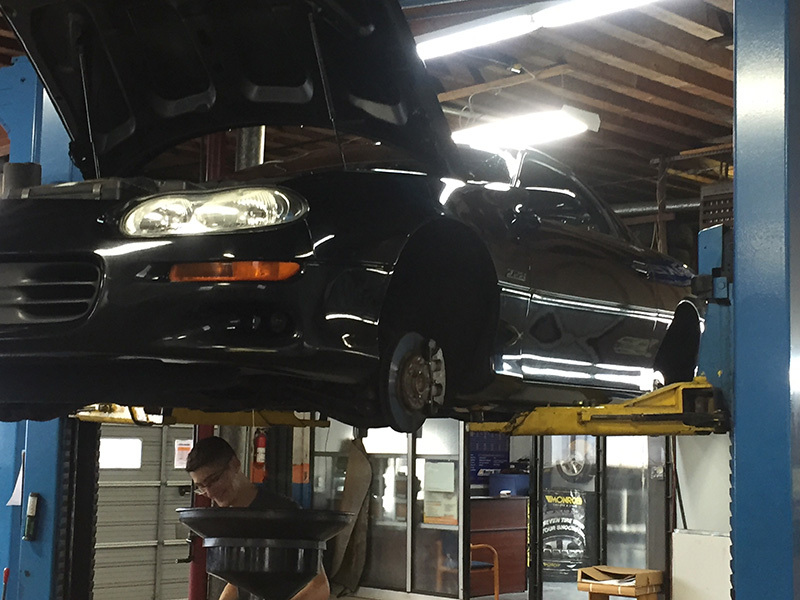 "I recently brought my vehicle in for a second opinion on my brakes that were squealing. Luay, the Owner assured me that he would help me out. His inspection was thorough and engaging as he removed the pads to show me the pad condition and measured the thickness to show me the little life remaining. He gave me options to service them to take care of the squeal or to simply wait until the sensor indicator prompts me for replacement. A very honest, competent and friendly mechanic/Owner whom I will refer to friends/family." "I made an appointment request online and they called me back pretty quick to set up an appointment. I was told by another shop that my brakes needed to be done before Christmas, so that's what I needed the appointment for and to put on winter tires. Well turns out that I didn't even need my breaks done for a little while. They could have changed them anyway and make me pay but they saved me money at that moment. What I thought was awesome is there was a female mechanic which we don't have enough of and even better you can watch while they work and that I like because it shows they have nothing to hide. And icing on the cake is they washed my car when done.... I don't live on the mountain but will definitely be a returning customer. Thank you for your honesty"
"After having been abused by so many mechanics, who upon seeing a woman walk into their shop can hardly hide their glee at having another female to fleece and abuse. Finally I found Master Mechanic, where they have female mechanics and are sure to treat you fairly. I was a bit concerned over the recent new ownership, fearing that the new owner would be one of the woman hating jerks who rip women off, but I was delighted by my most recent visit. After having my car repaired only two weeks ago, the check engine light once again came on - nooooo! I stopped in and met the new owner and told him the problem. He was very friendly and told me not to worry. After having one of the mechanics work on my car for over an hour to figure out the problem and fix it (it was a different problem from the most recent repair), there was NO CHARGE!!!!!! WOW! Talk about customer service!" "Ithe was a great experience. I had my XC90 Volvo serviced at Loui's Master Mechanics earlier this week. All was great and I will be back for my other car. Great work and great people." Recommended to anyone in the area! "I was at this location last week for a tire and oil change, the gentlemen "Luay" that took bought the business a few months ago helped me at the desk and provided excellent service, was very kind and gave me a mohawk student discount which was very kind of him, i recommend this master mechanic to anyone in the area"
"Always amazing and speedy service. Always there when you need them. Always a reasonable price and exceptional customer service. They always fully explain everything that's going on with my car so I can understand the situation, and what I can do to keep tabs on my car's performance and maintenance. I love these guys, and wouldn't go anywhere else. LIFESAVERS." "I haven't even gone in yet and Serena's already called me back with an estimate on a needed part as well as given a reasonable estimate for the time necessary to do the job. Very impressed with the level of communication and dedication to a customer who has yet to even arrive for service!" "Serena and Gord were fantastic. They were super friendly on the phone, took the time to discuss our problem and offer some suggestions. They performed the repairs on our car quickly and the price was lower than most of the competitors we called before we came in. The service is top notch here and I will be a customer for life. HIGHLY RECOMMENDED!" "I took my wife's car in today with a giant "honey-do" list of things to look after. Gord and Serena have always taken great care of us and today was no different. I explained that our hectic schedule made an appointment difficult to plan, so they offered a car while ours was in for service. I got the car in on a last minute call. I got the car back sooner than I expected. The bill came to less than either of us expected. I wouldn't even consider going anywhere else." "I have been going to Gord Ingram's location for several years. I have had the best service from Gord and Serena and all the gang there. They make you feel part of the family and I will not go anywhere else. When my car is serviced, it is done with efficient time ,and Gord drops me at the mall and picks me up also. There are not many people like them that are passionate for what they do for customers. I am also in customer service and I know how much value it means to me. well that's it and Merry Christmas..."
"I just want to say how happy I am with the excellent service I have received from Gord and his staff. I was recently referred to Gord by a friend, and I will continue to use Master Mechanic. I was most impressed by the cleanliness of the shop, and equally impressed by Gord and his staff, and the work that they performed on my automobile. Gord gave me a clear explanation of the work that needed to be done when I brought my vehicle in. After service, Gord again explained what he had done, and what would be needed to do in the future. He helped me understand exactly what was needed, and where I could save money in the repair without jeopardizing quality. He also made available a courtesy ride. Both my husband and I will be more than happy to refer our friends to Gord and Master Mechanic." "Thank you for checking out the 2012 Honda Civic for me. Thanks also for walking me through the steps of getting another car. I have appreciated the work done at Master Mechanic on my very old Nissan maxima. Your guidance and good service have been so helpful." "The owner of the location, Gord, answered and immediately begin assessing my service needs. Gord reassured me that my vehicle would be okay and that they can certainly help. After scheduling my car for service, we brought it in. 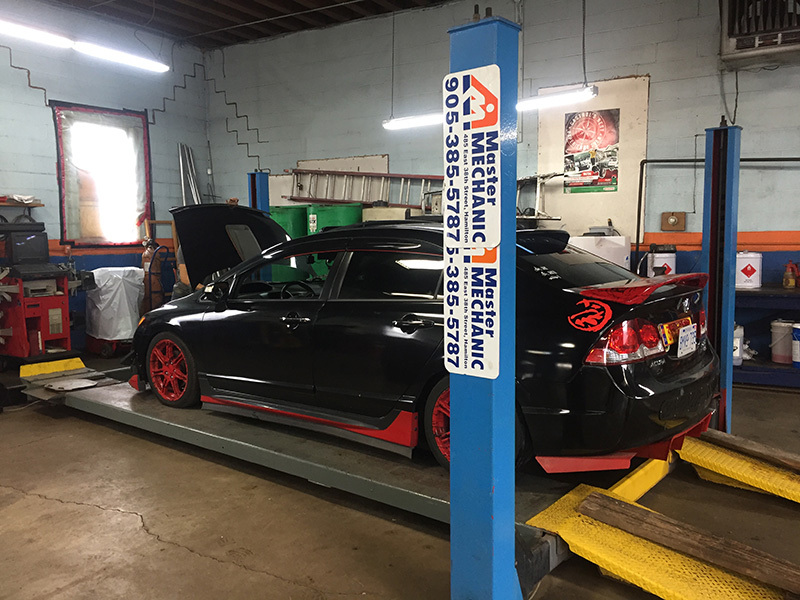 When we arrived at master mechanic we were greated by Sarena, a very nice and extremely knowledgeable service technician. 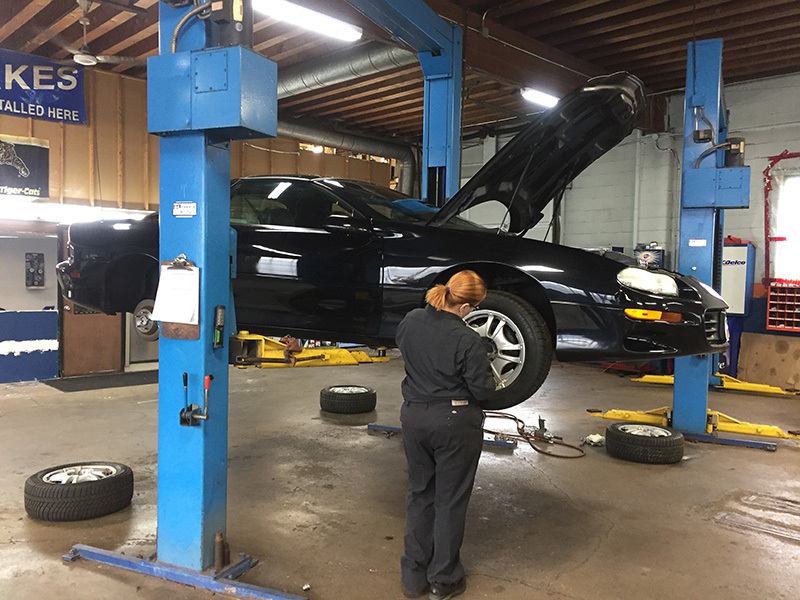 She explained the results of her diagnostic in relevent terms so that I understood each part that needed to be replaced, why it needed to be replaced, methods of preventing future failures, and in what order I should get the service performed. She even showed me some of the parts on the vehicle that had obvious signs of wear. Amazing customer service! After selecting the exact services I wanted performed, the team worked dilligently to accomodate me within a time frame I specified that I needed the work completed by. The services I chose were, Spark plugs, oil change with synthetic oil, and a transmission service to prevent future transmission failures, aswell as putting an end to the leaking oil in the driveway. I received a call a few hours later to notify me that my vehicle was ready for pick up. Upon arrival i noticed that my car had been washed, Tires and rims throughly cleaned and shined. With a quick turn of the key the engine started right up, much faster than it had with the wearing plugs. I drove my car home and was pleasantly surprised by how smooth the engine and transmission felt after these services. Gord's wonderful sense of humor and quality customer service really make getting my vehicle serviced an enjoyable experience. He has assembled a team of high quality mechanics who are eager to perform all services with dilligence and quality I was also pleasantly surprised with the price of the service, the quality of their service instills confidence that your vehicle is in good hands. I will certainly recommend these kind folks to everyone I can for their car care needs. Thanks so much Gord and the team! Dan Jalbert Doctor Dan's Computer Repair and IT Consultancy "
"Thank you for the excellent service over the past few years, especially my most recent visit. When I took my vehicle in I mentioned that I needed it for a trip to Niagara Falls the next day. Unfortunately, things happened beyond anyone’s control and the vehicle had to stay an extra day. Gord knew my situation and offered us the use of one of his own cars for our trip to the Falls fully knowing that we wouldn’t be returning until late Friday night. Everything worked out and I got my car back Saturday morning and was on my way. Thanks again for the great service!I would recommend this garage to anyone. " "This morning on my way to work I unfortunately ran over a bungee cord which pierced my tire. I happened to pull over to a parking lot and right there was a MM. I frantically called my husband to come and put my spare on so I could get to work. When he pulled in, he mentioned the MM and said he would see if they could fix the tire. My response to him was that they wouldn’t take us right away and it would cost a fortune! Well was I wrong...Brian and Gord provided the best customer service I have ever encountered. They took my vehicle in immediately and the cost was very reasonable. I was in and out in half an hour and on my way to work. Being in the customer service business myself, I was very impressed. I will definitely be back and will recommend them to anyone who will listen." "Just a quick note to thank you for the service on our cars. We have been looking for a long time for a good mechanic we like and trust. In this day and age, it seems increasingly difficult to find companies we enjoy doing business with and feel you guys are to be complimented."